Stephen Tyrone Colbert is an American comedian, satirist, actor, and writer known for his ironic style, particularly in his portrayal of uninformed opinion leaders and deadpan comedic delivery. Colbert originally studied to be an actor, but became interested in improvisational theater when he met famed Second City director Del Close while attending Northwestern University. He first performed professionally as an understudy for Steve Carell at Second City Chicago; among his troupe mates were comedians Paul Dinello and Amy Sedaris, with whom he developed the critically-acclaimed sketch comedy series Exit 57. 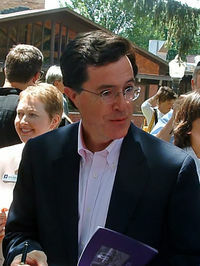 Colbert also wrote and performed on the short-lived Dana Carvey Show before collaborating with Sedaris and Dinello again on the cult telev Stephen Tyrone Colbert is an American comedian, satirist, actor, and writer known for his ironic style, particularly in his portrayal of uninformed opinion leaders and deadpan comedic delivery. Colbert also wrote and performed on the short-lived Dana Carvey Show before collaborating with Sedaris and Dinello again on the cult television series Strangers with Candy. He gained considerable attention for his role on the latter as closeted, gay history teacher Chuck Noblet. It was his work as a correspondent on Comedy Central's news-parody series The Daily Show, however, that first introduced him to a wide audience. Stephen Colbert isn't a Goodreads Author (yet), but he does have a blog, so here are some recent posts imported from his feed. Is this you? Let us know. If not, help out and invite Stephen to Goodreads.